The Hamburg Port is by far the most important in Germany and one of the leading sea goods transhipment centers in the world. It is the gateway to markets in northern, central and eastern Europe, the bridge between the Continent and overseas, as well as being the most important foreign port for Scandinavia and central/eastern Europe for container traffic. Even though 100 km (62 mi) away from the sea, the Hamburg Elbe Harbour is accessible even for the largest container giants, which can load up to 18 containers next to each other. The despatch terminals with a handling capacity of over 2500 TEU (Twenty-Foot Equivalent Units) containers in less than 24 hours ensure that they can leave the harbour within one day. Over 36 million tonnes of bulk cargo are handled by this port, such as oil, coal, ore, cereals, oilseed, feed, and fertilisers! To name just a few superlatives, the free-port is one of the most important paper transhipment centers in Europe, the biggest trading place for raw pharmaceutical materials and the biggest carpet-trading and warehousing center in the world. And not to forget... the Hamburg Port is the largest import harbour for coffee and one of the leading spice transhipment centers in the world. 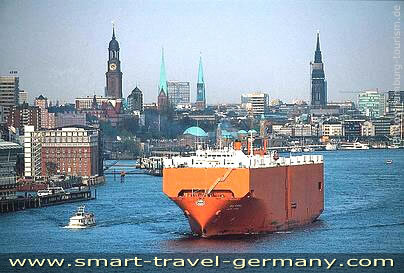 For raw cocoa, Hamburg is the number-one transit port in Europe. By the way, the harbour has for years been the main transhipment center for tea in Europe, well ahead of Rotterdam. The U.S., Canada, and even the U.K. get their tea from Hamburg!